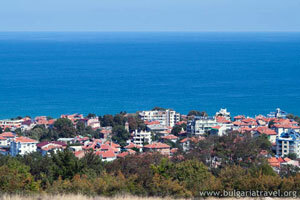 Obzor is situated on the Black Sea and has one of the longest beaches - 8 km. It is located close to Sunny Beach, Nessebar, Ravda, St. Vlas and other popular southern resorts. Obzor is a place where you can escape from everyday life and take a deserved summer vacation. Sun bathing or cooling off in the sea water. You can spend the evenings in some of the local restaurants offering traditional Bulgarian cuisine. Obzor is located near Stara Planina, where you can enjoy not only the sea but also mountains. On 9 km south you can find Irakli beach, protected area attracting with its unspoiled nature and purity. If you have decided to get away from the everyday life and want to relax, pitch your tent on right there or rent a beach bungalow. The church had been built with the help of all the citizens after the Liberation, when the city is settled by Bulgarians and Christians. There're exposed archeological and ethnographical artifacts representing the Bulgarian history and culture since the ancient times. It is Loocated on the northwestern Obzor, a great place for picnics and walks. Next to it you can find a beautiful waterfall, which is preferred spot during the summer. Take a walk enjoying the beautiful gardens, fountains and ruins of the ancient city of Heliopolis, and fragments of the Roman Temple of Jupiter.